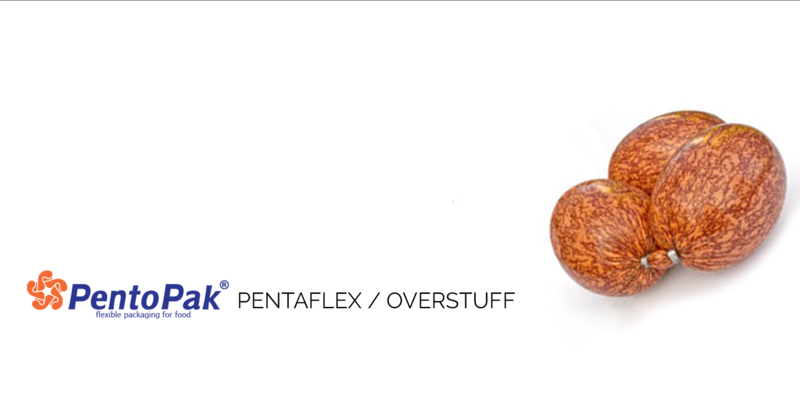 Darimex is distributing one of the leading worldwide brand in the business; Pentopak in Romania. Contact us for further details about Pentopak and its products. Private Joint Stock Company PentoPak has successfully operated on the Ukrainian market of polyamide packaging since 1998. We are confident in the future of flexible packaging and therefore make every effort to improve the multi-layer synthetic casings and shrink bags. - The experience gained from years of successful activity. 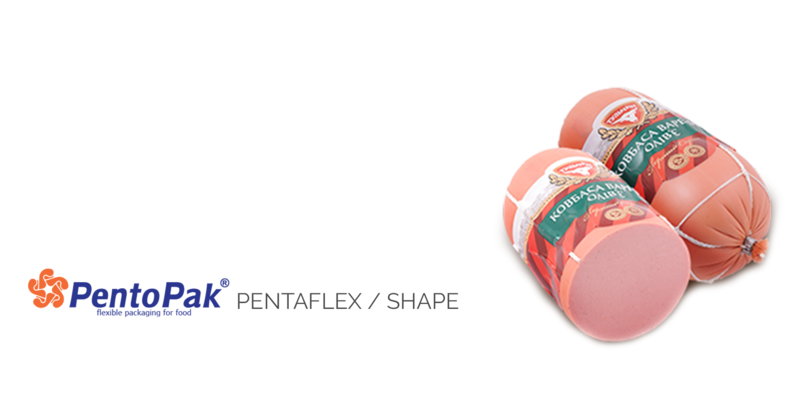 Pentopak products have been successfully used for packing meat products industry. The company is expanding its field of action with the modernization of the production is actively developing new markets packaging in dairy industry, fish processing, animal feed. Contact us for further information about Pentopak products dsitributed by Darimex. It is classic sausage casing, which is used for wide range of meat products. 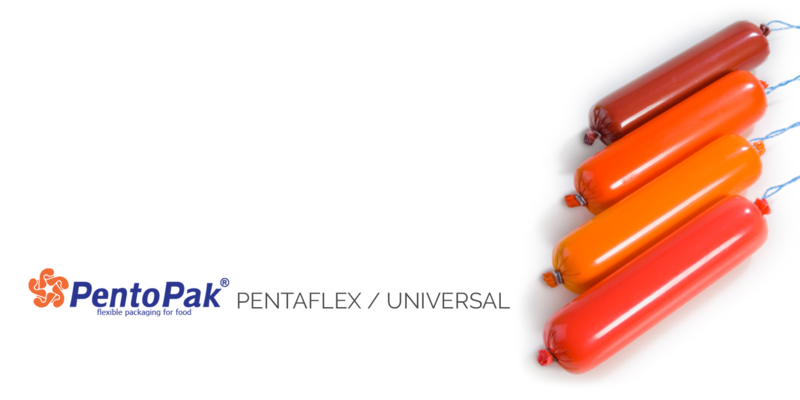 Pentaflex Universal is oriented for use on automatic and semi-automatic equipment. 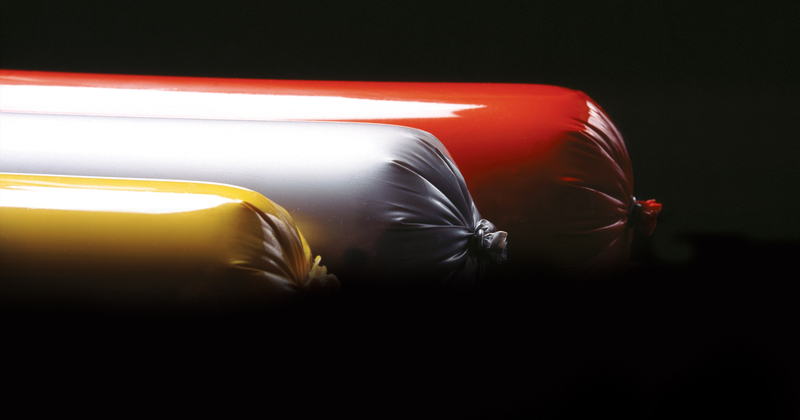 Sausages, packed in Pentaflex Universal, have a straight and smooth surface. It is delivered in reels or in shirred sticks, which contain 25-40 meters. According to customer’s wish, casing can be printed in different colors. We use certificated safe paints with resistance to high and low temperatures and endurance to mechanical damages. This casing is developed for packaging moulded hams and sausages of any configuration. Elasticity of such casing contributes to strict overlapping of the relief of metal form or grate, that are used, and also to saving form upon storing. Overstuffing is 15-25%. It can be used in combination with grids of different braiding. Assortment of casing is represented in 5 gloss colors and 2 matte colors. It is delivered in reels or in shirred sticks, which contain 25-40 meters. According to customer’s wish, sausage casing can be printed in different colors. We use certificated safe paints with resistance to high and low temperatures and endurance to mechanical damages. High elasticity (overstuffing till 60-70%) allows to make sausage products in the shape close to the natural bubbles (for example sphere, oval, olive). According customer’s wish, sausage casing can be printed in different colors from both sides. The unusual decision in design gives the form of decorated Easter eggs and colored Christmas balls to meat products and increases assortment with a new form of sausage products. We use certificated safe paints with resistance to high and low temperatures and endurance to mechanical damages. 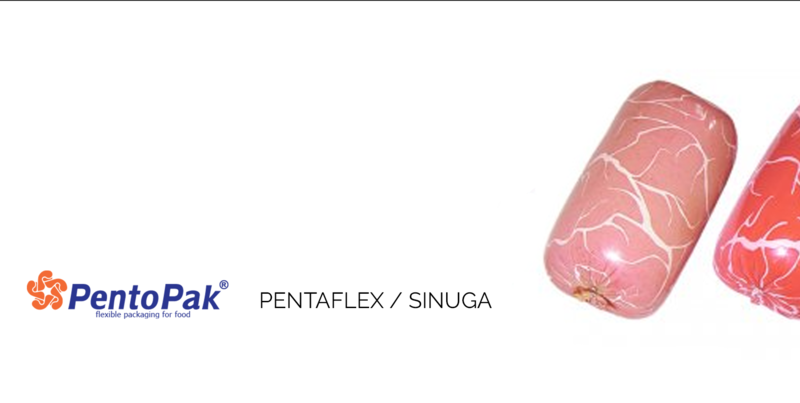 External appearance of sausages and hams, packed in Pentaflex – Sinuga, is very similar to natural sinuga, but at the same time without all disadvantages, that are inherent to natural sinuga. The main advantage of using such casing is high level of overstuffing 28-30%. Distinctive pattern of veins in combination with suggested colours makes appearance of meat products more attractive and allows marking out the content of sausage loaf and giving specific smoky colour to it. It is delivered in reels or in shirred sticks, which contain 25-40 meters. According to customer’s wish, sausage casing can be printed in different colours. We use certificated safe paints with resistance to high and low temperatures and endurance to mechanical damages. One of the main advantages of using of this sausage casing is the ability to make this casing in original shape of the ring, semi-ring and spiral. Overstuffing is 5-11%. The inside diameter of the foal ring is 170-230 mm. Pay attention: Pentaflex-Kranz is delivered only in shirring sticks containing 25-30 meters. Overstuffing is 10-14%. The inside diameter of the foal ring is 100-135 mm. Pentaflex-Kranz is delivered only in shirring sticks containing 25-30 meters. According to customer’s wish, sausage casing can be printed in different colours. We use certificated safe paints with resistance to high and low temperatures and endurance to mechanical damages. Unique casing which can be used in both ways with soaking or without soaking. Using casing without soaking saves your time. It is innovation sausage casing. It combines such features as elasticity and softness with high shrinkage. 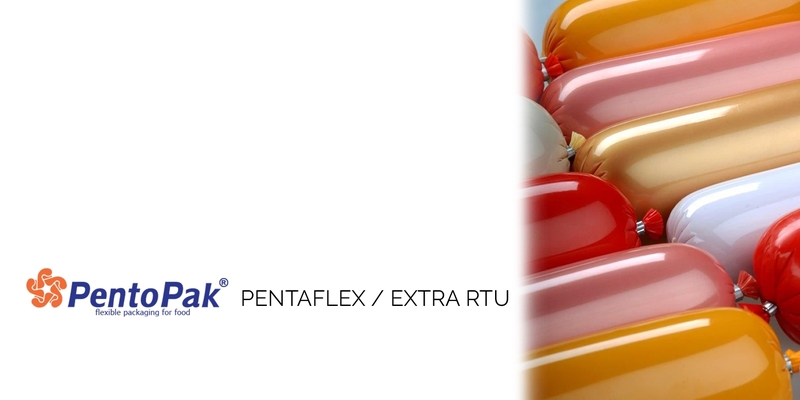 Distinctive feature of Pentaflex-Extra RTU® is that it can be used without soaking. If customer wants, it is also possible to exclude process of showering. For your attention: overstuffing without soaking– 5-10%, with soaking process it rises till 10-11%. This casing can be also used for sausage in molds. It is delivered in reels or in shirred sticks, which contain 25-40 meters According to customer’s wish the sausage casing can be printed in different colors. We use certificated safe paints with resistance to high and low temperatures and endurance to mechanical damages. Multilayer casings are produced on modern equipment from certificated materials of leading foreign companies. International system of management quality ISO 9001:2008, which satisfies international standards and requirements, is introduced at out manufacturing. Each production batch is tested in laboratory and receives quality certificate. The sausage casing Pentaflex® has Europian certificate for contact with food and safe for people’s health. Our specialists advice you to try Pentaflex® casing for packaging of dairy products such as: butter, spread, ice-cream, processed cheese. The main feature is using casing without soaking. Such feature saves your time and simplifies stuffing process. This method is the most effective for packaging spreads. 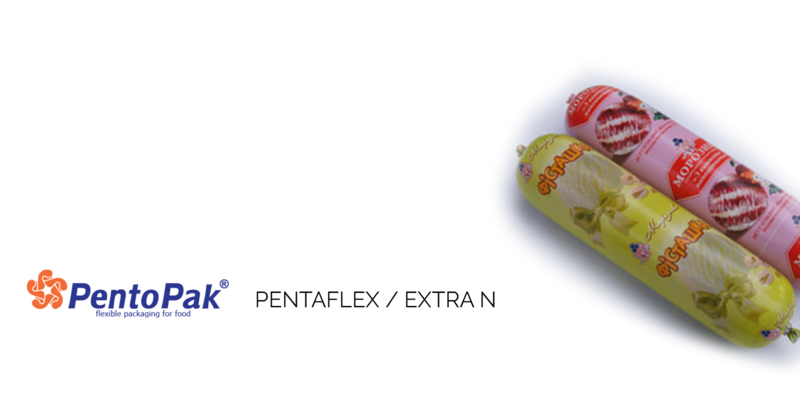 The main features of multilayer synthetic shrinkable casings Pentaflex®.